Why Do Cats Get Hairballs and Are They Normal? Hairballs are a just normal part of being a cat, right? Wrong. Chronic vomiting, with or without hairballs, could lead to lymphoma. Here's what every cat parent needs to know. It’s a frightening sight if you’ve never witnessed it before. Your cat’s entire body convulses, as loud retching rumbles from deep inside. Then a cylindrical object hurls out of her mouth and onto the floor, much to your horror. It isn’t pleasant for your cat either, and many of them will moan before this violent bodily act. We have a lot of things in common with our felines, but this is not one of them. As mammals, we are warm-blooded, nurse our young and possess similar vital organs and bodily functions. Although we do experience vomiting, “coughing up” hairballs is something associated mostly with our beloved kitties. 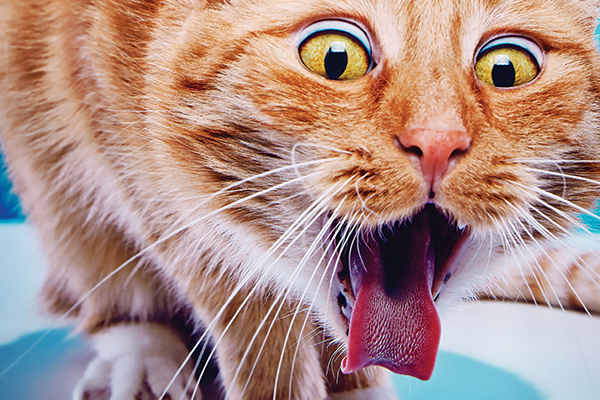 Actually, cats do not “cough up” hairballs. Because hairballs are ejected from the stomach through the esophagus, vomiting is the correct term. Hairballs, also known in the scientific community as trichobezoars, contain undigested hair and digestive fluids, including bile, which might explain their yellowish hue. Cylindrical in shape as they pass through the narrow, tubular esophagus, hairballs retain that shape as they are expunged from your cat’s mouth. How does a hairball form? A cat struggling with a hairball. Photography by Suzanne Tucker / Shutterstock. Cats are meticulously clean. They don’t take showers like we do and, unless they have mobility issues, don’t generally need to be bathed like dogs. Cats clean themselves with their sandpapery tongues, which contain backward-slanting papillae. These barbs grab loose, dead hairs that the cat swallows while grooming. Overly meticulous groomers and long-haired breeds are prone to swallowing more hair, especially during shedding season. While most of these hairs pass through your cat’s digestive tract and are eliminated in the feces, some of it remains in the stomach. As more hair accumulates in the stomach, it begins to form a clump that we know as a hairball. 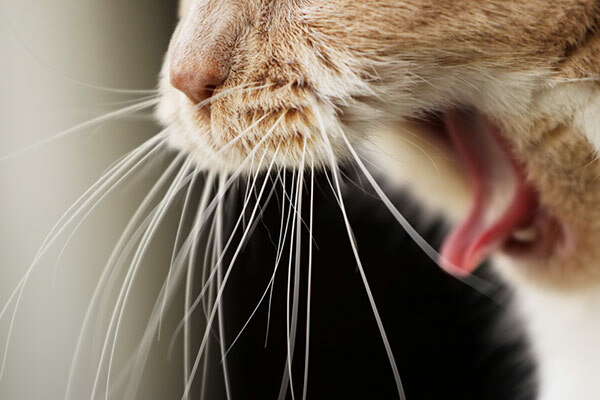 A hairball can become dangerous if the mass passes from the stomach to the intestine rather than being vomited, according to the Cornell Feline Health Center. In fact, this would be a medical emergency, because the hairball could create a life-threatening blockage, which requires surgical removal. If your cat tries but does not produce a bowel movement, vomits frequently or refuses to eat, take her to the vet right away. Is it a hairball or something more? Brushing your cat and removing loose hairs prevents your cat from swallowing too much hair, which keeps hairballs from forming. Hairball diets, which are high in insoluble fiber, fiber supplements and GI lubricants like Laxatone are effective at moving swallowed hair through the digestive tract so that it passes through the stool. While these remedies work at preventing hairballs, new research shows that we might just be treating symptoms and ignoring underlying disease. We may think of vomiting hairballs as a normal part of being a cat, but perhaps we should be asking why our cats are having problems moving swallowed hairs from the stomach through the rest of the digestive tract and expelling them through the feces in the first place. Decreased digestive motility, or hypomotility, could indicate something more serious. Chronic vomiting, whether or not a hairball is expelled, could be a symptom that warrants further examination. So, before starting a hairball remedy, take your cat to your veterinarian to confirm that the hairball vomiting is just about the hairball. “The problem with covering up vomiting with hairball diets, fiber supplements or GI lubricants is that it delays getting a diagnosis,” said Gary D. Norsworthy, D.V.M., a board-certified feline specialist and owner of the Alamo Feline Health Center in San Antonio. Dr. Norsworthy explained that chronic vomiting might be a symptom of small bowel, or small intestinal, disease. Small bowel disease starts with mild inflammation in the intestines and progresses to severe inflammation, a condition known as inflammatory bowel disease (IBD). In some cats, IBD progresses to lymphoma. “It is much easier to treat IBD than lymphoma,” Dr. Norsworthy said. “Sadly, many of the chronically vomiting cats I diagnose are already at the lymphoma stage.” Assuming that chronic vomiting is normal or treating the symptoms without an accurate diagnosis can allow disease to progress, he warned. In their groundbreaking studies of 100 cats (from 2008 to 2012) and 300 cats (from 2008 to 2013), Dr. Norsworthy and his colleagues examined cats who had been patients at the Alamo Feline Health Center and showed clinical signs of chronic vomiting, diarrhea, weight loss or some combination of these. Both studies were published in the Journal of the American Veterinary Medical Association (2013/2015). They continue their research and, to date, have studied more than 500 cats. What does this mean for those of us who live with cats? Bottom line: Don’t dismiss chronic vomiting as normal. “Chronically vomiting cats (even hairballs) need an ultrasound study and most likely biopsies of the small intestine,” Dr. Norsworthy said. What surprised him was how many chronically vomiting cats there are and how many of them have intestinal lymphoma. In fact, only one of the first 100 cats studied had a normal biopsy, necessitating further examination for all chronically vomiting cats. With so many cats afflicted with chronic vomiting, it’s no wonder that we accept it as normal. “Where there are cats, there are hairballs” might be an axiom we accept as part of life with cats. But Dr. Norsworthy and his colleagues refuse to accept that, and neither should the rest of us. The former editor of Cat Fancy magazine, Susan Logan-McCracken has specialized in pet and veterinary topics for nearly 20 years. She and her husband are the proud, adoring parents of two 9-year-old tabbies. Hairball control in dry cat food is good. When they go the hairball comes out in the litter box. It keeps them from throwing up hairball. why do they sell dry cat food with hairball remedy and treats with hairball remedy is that supposed to ? To get the Hairball up? Pingback:Cat Wheezing: What Is It, Why Does It Happen and Should You See a Vet? – user's Blog!